Chances are, the Grand Canyon University communications students gathered Thursday evening hadn’t heard of Jason King – but they’d probably seen his billboards. King is Vice President of Corporate Communications for the largest outdoor advertising company in the world – Clear Channel Outdoor, based in New York. It is credited with creating nearly 1 million displays in more than 50 countries and in 48 of the 50 largest markets in U.S.
“That includes Phoenix,” King told the several dozen students during a session coordinated by the Lambda Pi Eta honors society. Clear Channel’s Arizona billboards have featured messages from the Phoenix Police Department, the University of Arizona, the Tucson Roadrunners, the City of Goodyear and the Polaris Project. 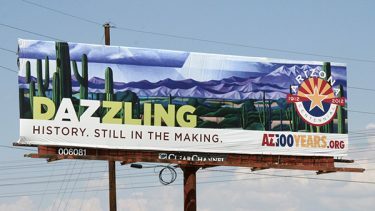 Clear Channel Outdoor donated this space for celebrating Arizona’s centennial . The Phoenix and Tucson regions are strong markets because of all the time commuters spend in cars. You can’t DVR or skip past a billboard, King said. They are always visible. Data gleaned from cell phone users who have consented to the use of location services creates a far clearer picture of consumer habits than ever before, King said. “We recognize your patterns,” King said. Consumers, he said, are defined by where you go and what you do. Location services data reveals where you go – and where you stop. It can track and analyze your patterns and know that you stop, for instance, at a certain McDonald’s for 15 minutes three times a week. This information allows ad agencies and brands who use Clear Channel to place their ads at optimum locations. For example, if Clear Channel Outdoor RADAR knows that customers (or their phones) travel down a specific road stop at a specific McDonald’s, it will suggest to the advertiser a billboard for McDonald’s on that road. Anyone who uses the internet to search for products knows this to be so when that coveted pair of shoes, for example, follows them from website to website, he said. Joshua Danaher, Assistant Professor of Communications in the College of Humanities and Social Sciences, said it was a “privilege” to hear King’s presentation. 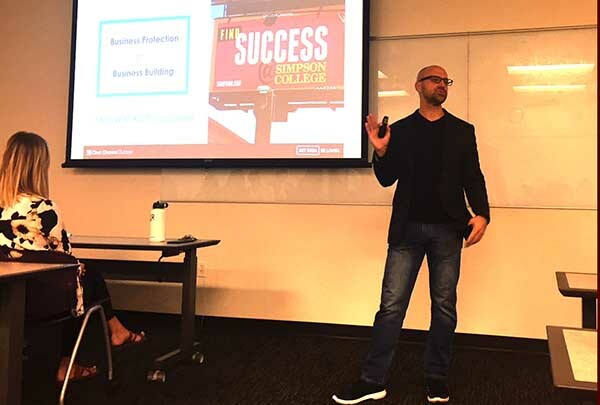 “He provided invaluable insights about content marketing and public relations,” Danaher said. “The idea of mobile tracking for ads is still fascinating to me and really seems to be paving the way for marketing/advertising to be done in the future,” she said.